Mommy Jane had brought the whole family of whom include my parents, siblings, nieces, nephews and of course my 5 Little Angels too for a 3 day 2 night stay at Kuantan since it is their school holiday and Mommy Jane need a holiday too. We had planned this trip since September this year where Mommy Jane had bought some hotel and theme park vouchers at Matta Fair at an attractive price to help Mommy Jane to save more for the trip. One of the hotel stay voucher that Mommy Jane bought is at Hotel Mandurah which is located at Berserah Beach. We had booked a total of 9 rooms for the trip. Nestled on the beach, this hotel is within 10 km from the Natural Batik Factory, Taman Gelora, Kuantan Recreation Park, Gelora Park. Telok Cempedak and Taman Teruntum Mini Zoo and around 20 minutes to Kuantan town. Hotel Mandurah had a beautiful scenic beach front and it is the tallest building on the pristine of Balok beach fronting the clear blue waters of South China Sea. There is a private beach, a restaurant and a bar which are available at the resort. Free parking was provided with a 24-hour front desk, a picnic area and a front-desk safe are onsite. Mommy Jane check-in to the hotel around 5 p.m. There is a total of 60 rooms and each room comes with free WiFi, wired Internet plus minibars, air-conditioned and TVs. You can opt for a queen size bed or double single bed. Or you can also opt for their Family suites that can accommodate up to 4 adults. You can also find coffee makers, safe, fridge and water heater too. The rooms were spacious and comfortable to stay and each unit had a unique designed with modern tradition. There is a study table and toiletries were provided. Toothbrush with toothpaste and even a comb were provided too. The toilet is like Japanese style. Unable to lock but you can still close it. Some of the rooms are overlooking a panoramic view of the mesmerizing South China Sea. All rooms came with breakfast. You can opt to eat at the cafe itself or just sit outside the cafe where you can enjoy your breakfast while facing the sea. Mommy Jane also can look out for Little Angels who were enjoyed playing at the beautiful beach while Mommy Jane and hubby enjoying our yummylicious buffet style meals. Hotel Mandurah was located at Pantai Berserah, 26100 Kuantan, Pahang. Rooms at Hotel Mandurah ranging from RM200.00-RM450.00. You can contact them at 019-9813455 / 09-5445566 / reservation@mandurah.com,my. You could also check out their website at www.mandurahhotel.com/ and facebook page at www.facebook.com/mandurahkuantan/. Mommy Jane loves the location of the hotel coz' it is located just in front of a clean beach. The price was affordable and we can view the beautiful sea from our window and listen to the sound of the wave. It is just 20 minutes from town and Pak Su Seafood was walking distance from the hotel. Lots of stalls and even grocery just opposite of the hotel. 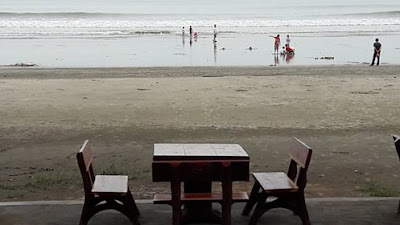 It is indeed a very convenient place to stay while enjoying our holiday at the beach and my Little Angels love the place so much. CHUEN, indeed it is. A bit of sand at the floor since it is located at the beach but overall, a great experience for all of us. The room are cosy and clean. Hope you enjoyed your short holiday with family. Elana, we did enjoyed it very much especially at a clean beach overseeing the beautiful sea. Miera, indeed it is. You should bring your family here too. Ivy, l'm sure you will love this place too. A must visit for holiday. I've not explored Kuantan before and I'm quite surprised there is such a reasonable hotel there. I'm pretty impressed, in fact.